The annual Lincoln Christmas Market will open to visitors at 12pm on December 5, with both popular favourites and new stalls and attractions for all the family. The market, now in its 31st year, starts early on Thursday for the traditional residents’ day, giving more time to browse stalls before visitors are invited through until December 8. At 5.30pm on December 5, the market will be officially declared open with Evensong at Lincoln Cathedral by the Mayor of Lincoln, Councillor Patrick Vaughan. An official Christmas ceremony will follow, delivered by the Dean of Lincoln Cathedral. Check out our superguide for all the info you need as a resident and visitor for the 2013 market. As usual, the market is divided into a number of zones, spanning the Castle, The Lawn complex and surrounding roads in uphill Lincoln. Last year, there was a one-way system in place to help with crowd control, but due to the unpopularity of the scheme, this has been scrapped. A one-way system will only be in place if needed during busier periods. Zones range from indoor and outdoor stalls to food courts and Medieval Markets. There will be almost 300 different stalls to browse, all offering a variety of items. Many of which are from the Lincolnshire area. Due to the history of the market, a typical theme is German crafts, food and drink, though there are plenty of quirky gifts for children, from bubble machines to traditional wooden toys. For adults, there’s fine jewellery and bags, wools for the winter months, home furnishings among much more to give as first or enjoy for yourself. Stalls can be located in the Castle Grounds, The Lawn complex and Bishop’s Palace, and there are also special marquees around the market offering different items, like a craft tent, Christmas Party tent, kids’ marquee and a bazaar. There are also a number of independent Lincoln shops lining the route of the Market, open through the event, offering all kinds of items. The main food court will be in Castle Hill, but you can find a variety of food stall throughout the Market. Like any good Christmas market, Lincoln’s offering will provide you with plenty of great tastes as you browse. To stay warm while you walk, you can pick up a classic mulled wine from a number of catering stalls, or for something sweeter a Bailey’s Hot Chocolate (or without the alcohol for the kids). For food, find snacks such as roasted chestnuts, or baked goods such as cakes. There’s always a currywurst or hog roast to test out, or classic fish and chips for dinner. Many stalls will also be stocking food to take home, from locally sourced pork pies to tasty biscuit selections, or cheese and wine stalls. Lincoln Christmas Market is a family event, so there is plenty to do for children as well as adults. Jingle, the Christmas Market’s resident elf, has organised for Santa to take some time out at the busiest time of the year to visit the market and meet some of the event’s youngest visitors at Wickham Gardens, near the Water Tower. He will have a postbox for children to post their letters so Santa can take them back for Lapland for his elves. Around the market, there will be a kids’ marquee, a fun quiz, Spot Jingle, fun fact sheet and colouring in sheet for kids, all available on the Christmas Market’s website.There are also a lot of rides to enjoy for kids of all ages! If you are concerned about becoming separated from your child at the event, there are free wristbands available at the Visitor Information Centre in Castle Hill, at the Park and Ride station and from stewards on all entrances. Parents can write a contact number on the back of the band in case groups get lost or separated, and be reunited from certain points at the market. Please note dogs are not permitted at Lincoln Christmas Market, except guide dogs. There are a number of campsites in operation around the city for those wishing to camp during the event. For a list of sites and contact details, click here. If you are found parking within the Market perimeter without a permit, you will be issued a fine by Lincolnshire County Council’s Parking Wardens. A number of roads in the area will be closed or temporarily blocked while the market is underway. Residents will be given parking and access pass if within the restricted area. If a resident needs extra passes, or needs a business permit, visit City Hall or the Visitor Information Centre in Castle Hill, with proof of address. 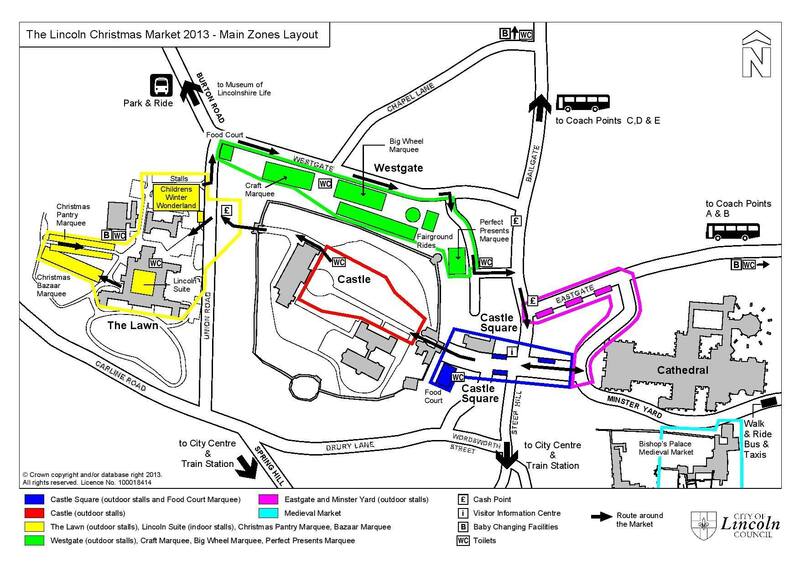 Visitors are residents from other areas of the city should be aware there is no parking near to the market. Therefore, it is advised that cars should park at Lincolnshire Showground, on the A15 just north of Lincoln, and use the Christmas Market Park and Ride service. The sat nav the postcode is LN2 2NA. There is also a dedicated service for people with disabilities, using specially adapted vehicles, which also runs from the showground. All buses drop off people close to the Museum of Lincolnshire Life on Burton Road. An advance ticket for Park & Ride is £12 and can be booked from Bradsons. Prices vary on the day and are displayed below. For visitors coming from further afield, East Coast Trains will be hosting a special Lincoln Christmas Market train to ferry you to the city and back. The return service will depart at Leeds, and will run on the Saturday only. The train will depart Leeds at 6.59am, calling only at Doncaster at 7.43am, and the return service will depart Lincoln at 8.20pm. Tickets for this train are available now, with a standard return starting at £8.15 when booked online, and further discounts available. Additionally, a number of coach operators will be running day and weekend trips to the Market from various parts of the country. You can find more information on coach trips to Lincoln on the National Holidays website. East Midlands Trains will also be putting on extra services by adding additional carriages to a number of its trains. These services will operate with eight-carriages, providing over 450 seats per train. 0850 Derby to Lincoln departing from Long Eaton at 0903, Beeston at 0912, Nottingham at 0927 and arriving in to Lincoln at 1020. 1140 Nottingham to Lincoln arriving in to Lincoln at 1225. 1555 Nottingham to Lincoln arriving in to Lincoln at 1646. 1400 Lincoln to Nottingham arriving in to Nottingham at 1450. 1710 Lincoln to Derby departing from Nottingham at 1810, Beeston at 1818, Long Eaton at 1828 and arriving in to Derby at 1842. These services will operate with seven or eight carriages, providing up to 450 seats per train. 0850 Sheffield to Lincoln departing from Chesterfield at 0904, Alfreton at 0920, Langley Mill 0928, Nottingham 0951 and arriving in to Lincoln at 1042. 0855 Derby to Lincoln departing from Long Eaton at 0905, Beeston at 0912, Nottingham 0918, Lowdham at 0930, Newark Castle at 0944, Collingham at 0956, Hykeham at 1006 and arriving in to Lincoln at 1016. 1116 Nottingham to Lincoln departing from Lowdham at 1127, Newark Castle at 1144, Collingham at 1156, Hykeham at 1207 and arriving in to Lincoln at 1217. 1350 Nottingham to Lincoln departing from Carlton at 1357, Lowdham at 1404, Newark Castle at 1418, Collingham at 1430, Hykeham at 1440 and arriving in to Lincoln at 1453. 1507 Nottingham to Lincoln arriving in to Nottingham at 1603. 1610 Nottingham to Lincoln departing from Newark Castle at 1637 and arriving in to Lincoln at 1704. 1219 Lincoln to Nottingham arriving in to Nottingham at 1311. 1245 Lincoln to Nottingham arriving in to Newark Castle at 1309, Lowdham at 1324 and Nottingham at 1339. 1506 Lincoln to Nottingham arriving in to Hykeham at 1513, Collingham at 1523, Newark Castle at 1537, Lowdham at 1550 and Nottingham at 1603. 1628 Lincoln to Sheffield arriving in to Nottingham at 1711, Langley Mill at 1744, Alfreton at 1756, Chesterfield at 1803 and Sheffield at 1831. 1711 Lincoln to Derby arriving in to Newark Castle at 1734, Fiskerton at 1742, Lowdham at 1751, Carlton at 1758, Nottingham at 1815, Beeston at 1820, Long Eaton at 1831 and arriving in to Derby at 1842. 1815 Lincoln to Derby arriving in to Nottingham at 1909 and Derby at 1937. 0936 Cleethorpes to Lincoln departing from Grimsby Town at 0946, Habrough at 0956, Barnetby at 1011, Market Rasen at 1028 and arriving in to Lincoln at 1048. 1135 Sleaford to Lincoln departing from Ruskington at 1143, Metheringham at 1153 and arriving in to Lincoln at 1207. 1527 Lincoln to Sleaford arriving in to Metheringham at 1539, Ruskington at 1549 and Sleaford at 1559. 1652 Lincoln to Cleethorpes arriving in to Market Rasen at 1708, Barnetby at 1725, Habrough at 1735, Grimsby Town at 1747 and Cleethorpes at 1756. 1910 Lincoln to Nottingham arriving in to Newark Castle at 1935, Fiskerton at 1941, Lowdham at 1948, Carlton at 1955 and Nottingham at 2004.